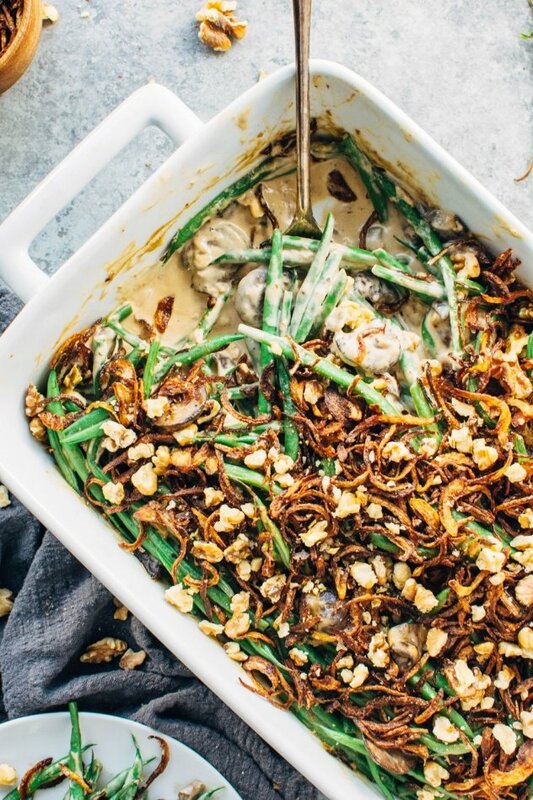 Like all proper green bean casseroles, this one starts with a super creamy homemade cream of mushroom soup situation. 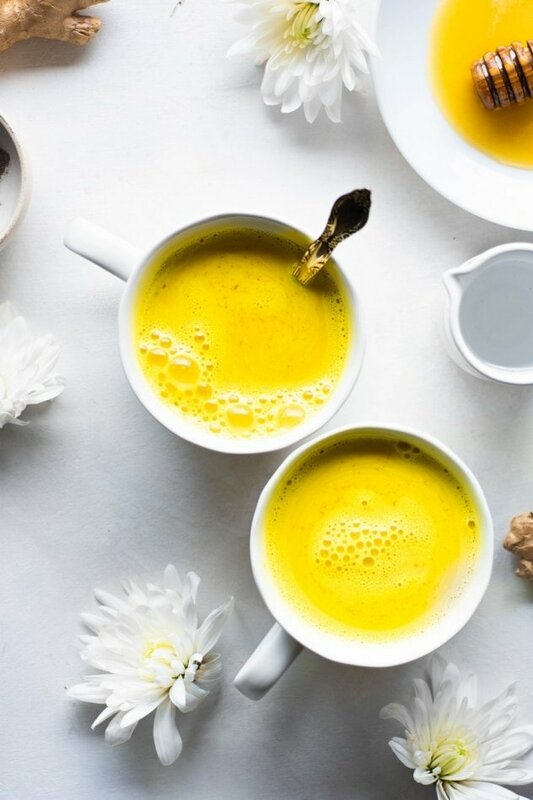 The ingredients for this a pretty basic, and it’s fairly fuss-free. 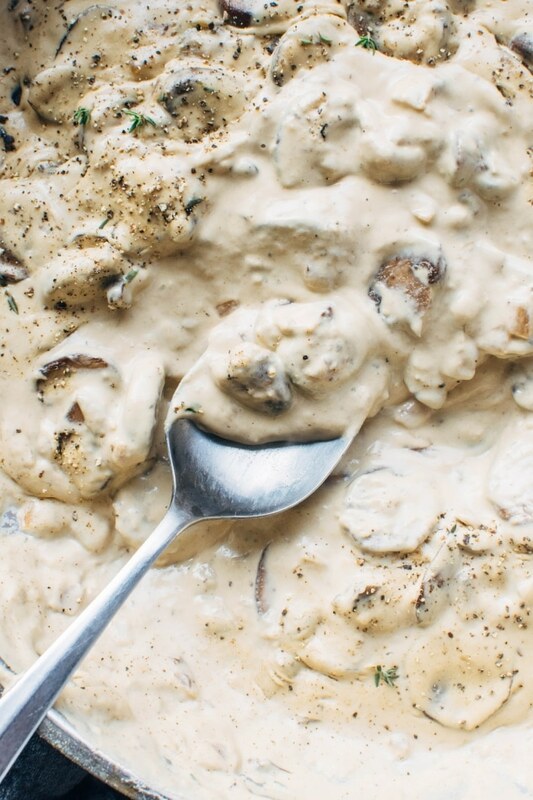 what’s in the cream of mushroom base? 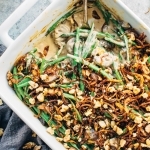 There’s caramelized onions, garlic, thyme and of course, mushrooms. 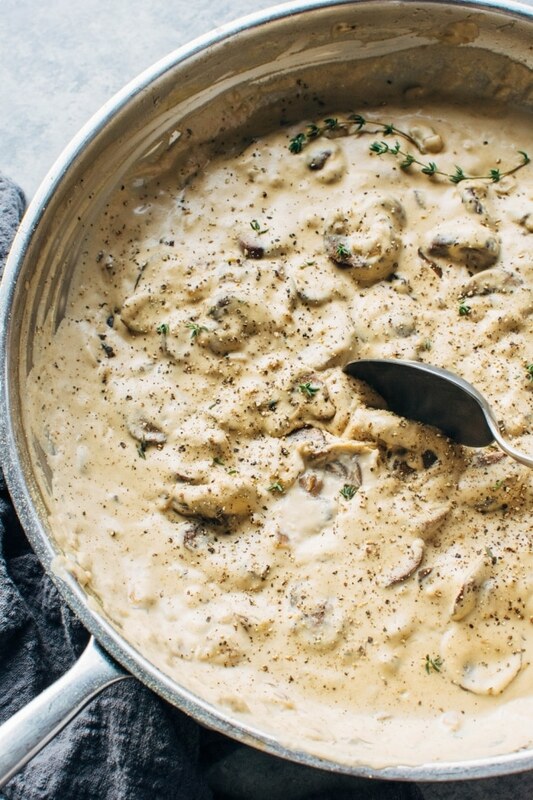 This recipe is free of flour and actual cream, and instead relies on the ever versatile and well loved cashew cream to make it creamy and luscious. I’m kind of obsessed. If you’ve been around here for long enough you probably already know. 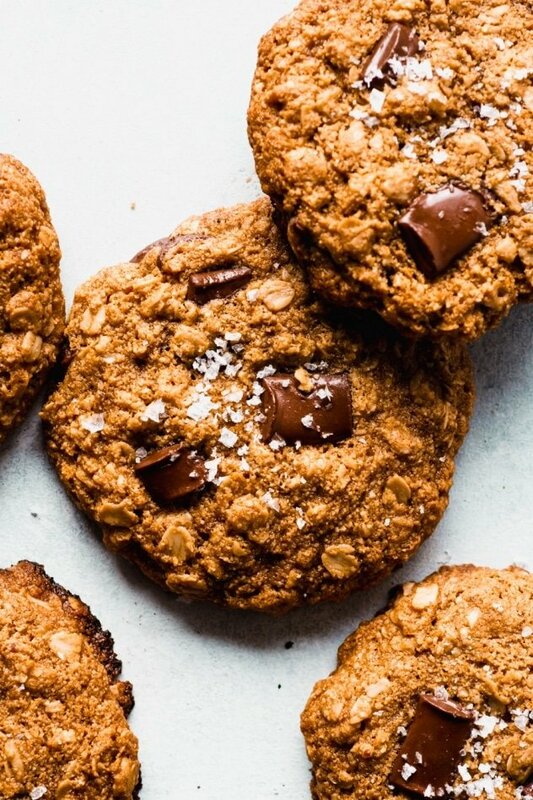 I promise that once you make a batch or two and experiment with it in your kitchen you’re gonna looooove it too. 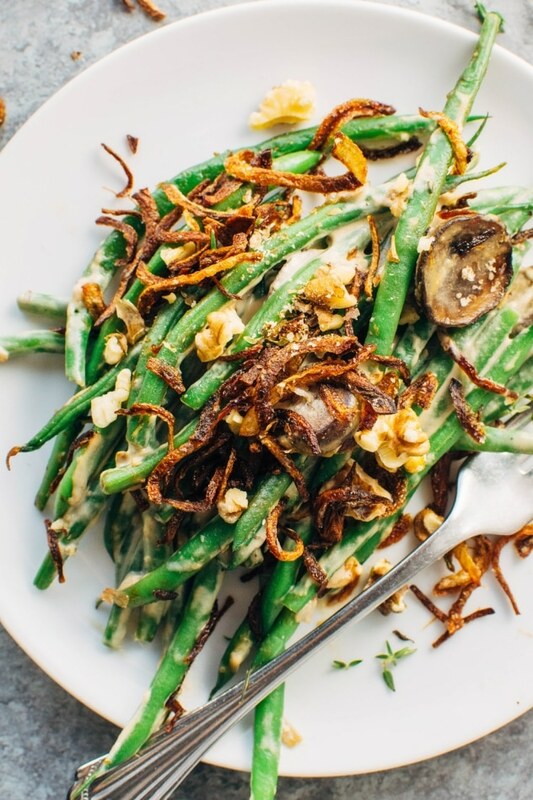 Once ready, this perfectly creamy sauce gets folded into some blanched green beans and topped with everyone’s favorite part of the dish. 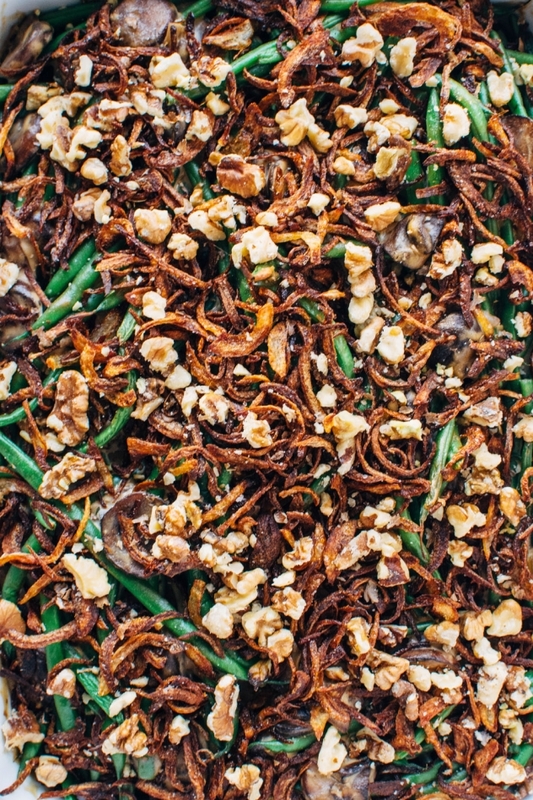 THE CRISPY SHALLOTS! Or onions – which is what I opted to use in this recipe. I had a small bag of tiny little yellow onions from my Imperfect Produce delivery that worked just perfectly. 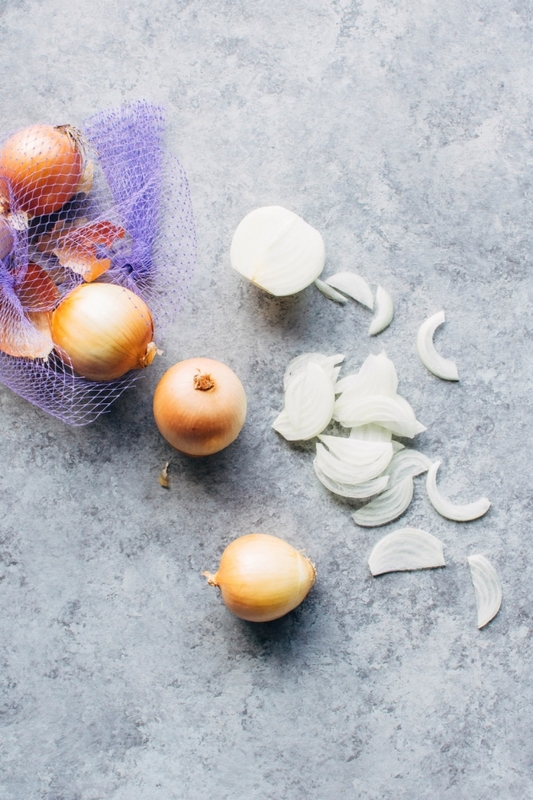 Either shallots or onions will do, but if you can find small ones, onions are a little bit less cumbersome to peel and slice, and thus make the whole process of frying up that crispy goodness a bit less involved. Whichever you decide to use, make sure you slice them quite thin, and as uniformly as possible. That way they will all brown up around the same time, and you won’t have some that are perfectly cooked (thinner pieces) and some that are still soft and soggy (thicker pieces). 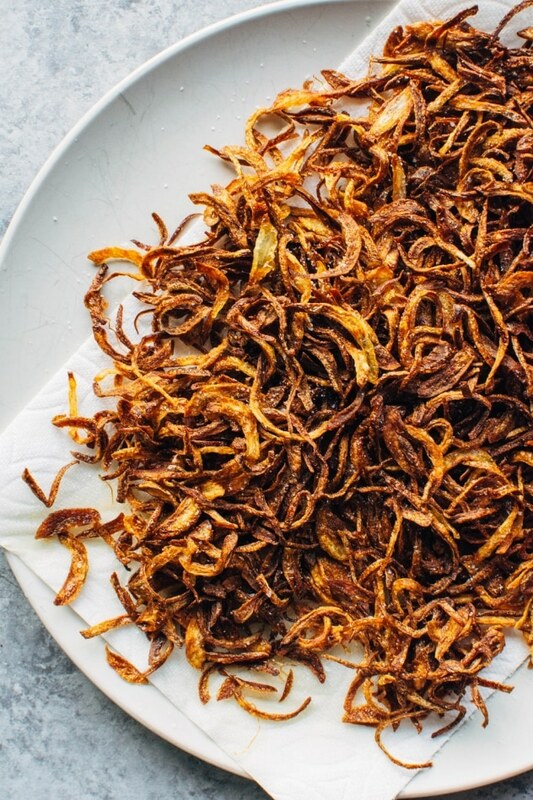 Perfectly fried shallots / onions are such a gorgeous thing. I included some toasted walnuts on top as well, just for a little extra crunch and depth of flavor, but if you want to go a more traditional route you could skip those and just use the onions. Or if you don’t want to spend the time frying up the shallots / onions, just toasted walnuts make a lovely and easy substitute. Happy Thanksgiving, friends! May this season be full of healthy meals that satisfy both your well being and your classic comfort food cravings. 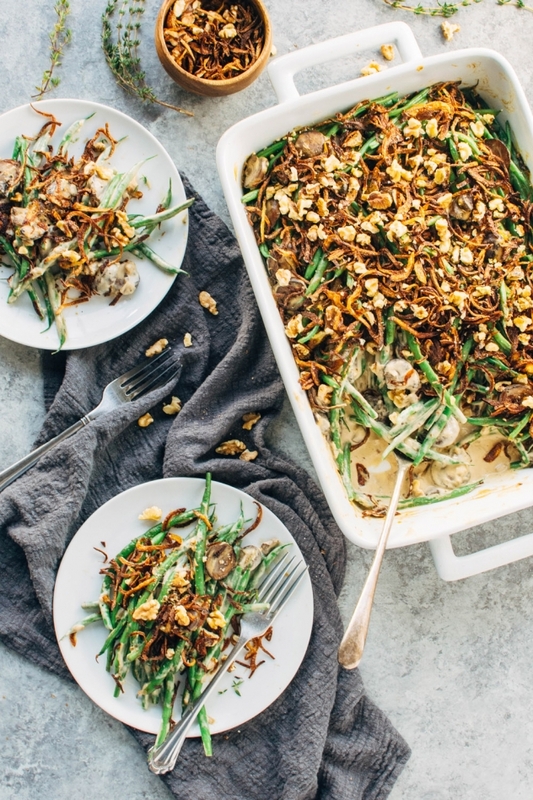 Grain free paleo vegan friendly green bean casserole! Made with all the same comforting flavors that you love in the classic casserole, with ingredients that you can feel good about. 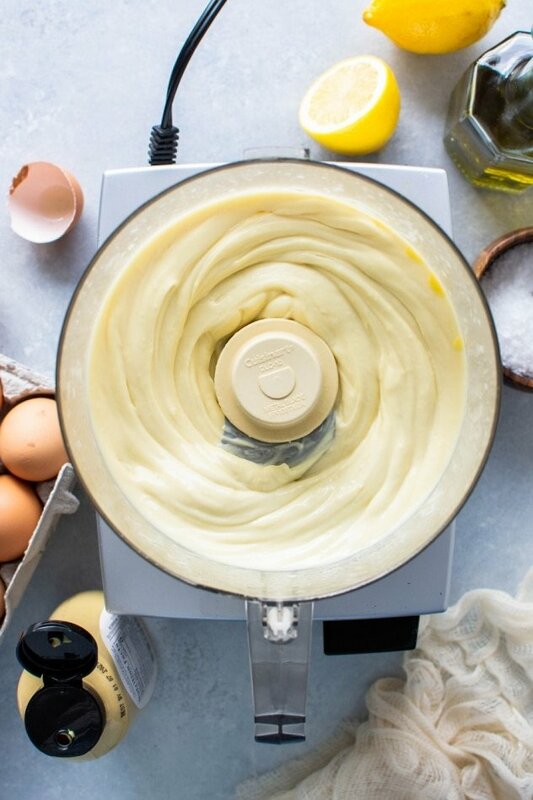 Make a batch of cashew cream following the instructions from this blog post. Recipe will make a little more than you need for THIS RECIPE. Extra will keep in the refrigerator for several days. Heat about 1/2 inch of avocado oil in a steep sided sauté pan just barely above medium heat. When oil is hot and shimmering add thinly sliced onions or shallots and cook, stirring every so often, until they are deep golden in color. This will probably take anywhere from 14-20 minutes. Shallots will definitely brown faster than onions. Just before they start to brown you’ll notice that the onions (or shallots) shrink quite a bit in size – the pan will seem less full. Once they start to brown keep a close eye on them so they don’t burn! They will go from light brown to deep brown fairly quickly. When they’re done, move to a paper towel lined plate to drain and sprinkle with salt. A slotted spoon is very helpful for this step. Set aside. Can be made up to 1 week in advance and stored in an airtight container in the refrigerator. Bring back to room temperature before using. Heat a large pot of salted water to boil. Add green beans to boiling water and cook for 3 minutes (closer to 5 if you’re using a regular thick green bean). You want them to be bright green and crisp tender. Drain and place directly into ice water to shock beans and stop the cooking. Once green beans are cool, drain thoroughly and lay out on a kitchen towel to dry while you prepare the sauce. Heat 2 tablespoons of avocado oil in a large skillet over medium heat. Add onions and cook until starting to soften and brown. Add mushrooms and continue cooking until mushrooms have collapsed, are dry, and everything is nicely caramelized – about 10-12 minutes . Add garlic and thyme, cooking just until garlic is aromatic – about 2 minutes. Pour in the first cup of broth and scrape up any brown bits from the bottom of the pan. Lower heat and simmer for 8 minutes – until flavors are well combined and broth has reduced slightly. Stir in cashew cream and extra 1/2 cup of broth plus the nutritional yeast. Bring back to a simmer and cook for another 5 minutes or so – until reduced again slightly. If sauce gets too thick you can thin it out with another splash of broth. Fish out the thyme sprigs and season to taste with salt and pepper. 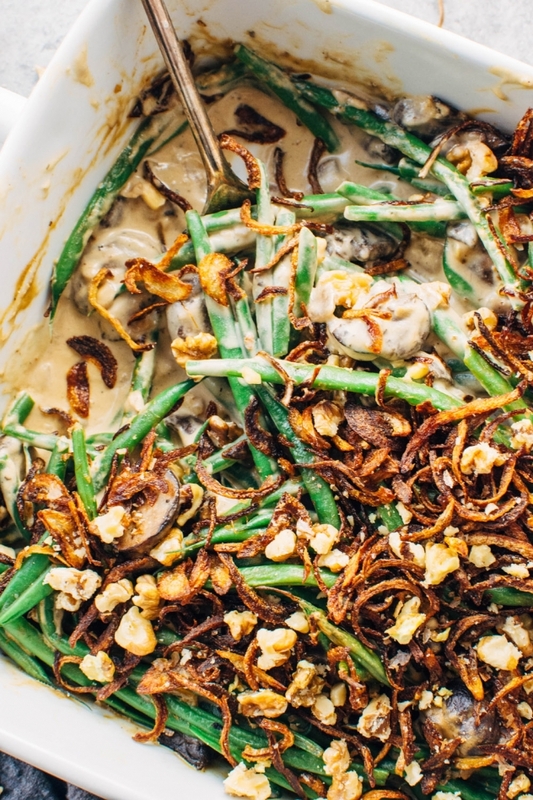 Add green beans to saute pan and toss to coat in cream of mushroom base, adding little broth to stretch the sauce for all the green beans if necessary. You want it to coat the green beans, but not be watery. Move to a 9X13 inch baking dish and bake for about 15 minutes, until heated through. 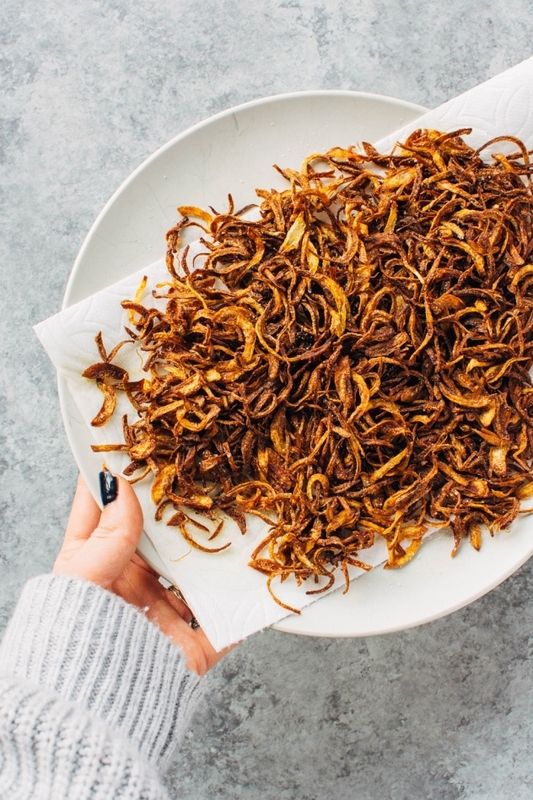 Sprinkle with crispy onions and bake another 2 minutes, keeping a close eye on it so crispy onions don’t burn! Let sit for just a few minutes so onions crisp up again. Sprinkle with toasted walnuts and serve. Casserole portion and onions can both be made ahead of time, but store them separately until you’re ready to bake. 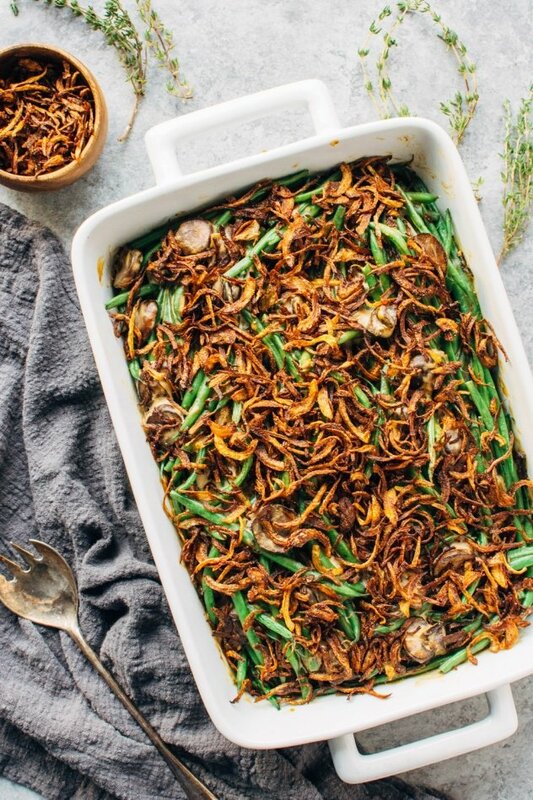 If the casserole portion is going from the refrigerator to the oven allow another 5 minutes of oven time before adding the crispy onions to make sure it’s heated all the way through. Some optional add-ins if you want to spruce the casserole up even further: Cooked bacon pieces – stir in to sauce just before warming casserole. 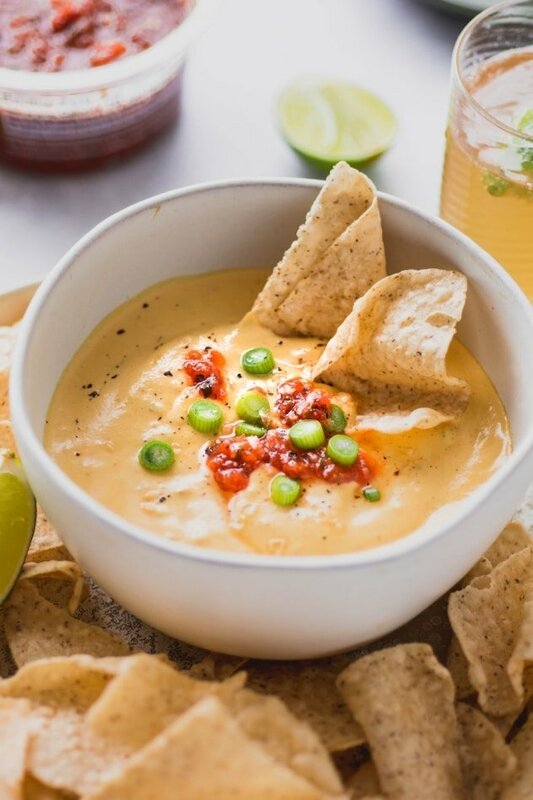 Hot sauce – add to cream of mushroom sauce to taste! 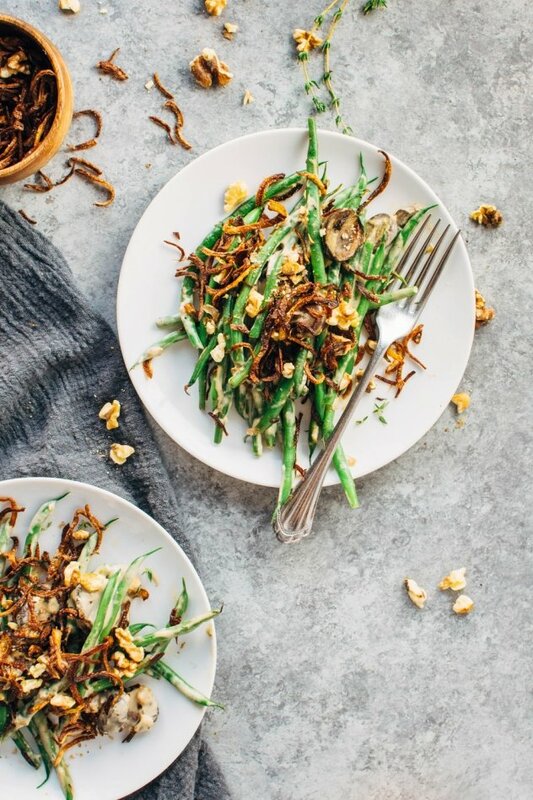 The cooking times in this recipe is for a crisp tender green bean. If you like your green beans in green bean casserole to be more tender you’ll want to boil them for a few more minutes before blanching. Forgot to take a photo but this turned out amazing. I did add a ton of bacon which never hurts. Thanks for the recipe! Amazing! 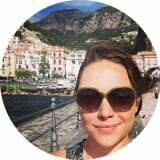 So happy you loved it! !